In a news that will bring smiles to millions of basic handset users across the country, they will now be able to carry out most banking transactions (like PIN change, funds transfer, payment of low value bills, getting new cheque book, bank passbook request and balance enquiries and many more such simple services) using a basic handset, without the need to connect to the internet. Though the Telecom Regulatory Authority of India (TRAI) has been urging the telecom companies to enable bank authorized mobile payment companies to offer such services for a long time, most of them have not been too willing to co-operate on that issue. Telecom Operators like Airtel, Vodafone and Idea have already introduced mobile banking services to pay utility bills, availing recharges, etc and they have been reluctant about rolling out Unstructured Supplementary Service Data (USSD) operations, fearing they will lose out on a sizeable revenue if that happens. They are, however, now expected to fall in line with the payment companies inside the country lobbying with the regulator and the government for allowing them to tap the USSD channel of telcos. 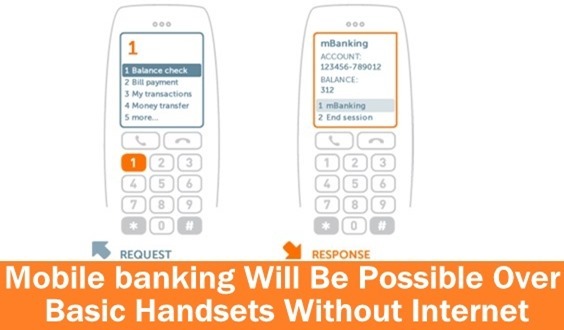 The USSD refers to a simple interactive text messaging system using which a mobile phone user can reach out to his/ her bank for simple banking services. Though USSD is a pretty old technology, it holds great significance for a country like ours where internet penetration is low and a greater percentage of people use basic handsets over which they cannot connect to the internet. Any mobile user will soon be able to able to ‘talk’ to his/ her bank by typing a simple SMS like perhaps *999#. Executives of Movida, a 50:50 mobile payments joint venture between Visa and the UK-headquartered mobile money specialist Monitise, asked the TRAI to intervene in the matter last week to obtain USSD code from telecom companies. That came shortly after the telecom companies agreed to share their infrastructure with the state-backed payments gateway, National Payments Corporation of India, rather grudgingly. NPCI features in the Modi government’s financial inclusion plan prominently. Prominent credit card companies in India like MasterCard and Visa have spoken against the government policy of providing USSD code to a single entity like the NPCI and been proposing that they should work on providing a level playing ground for all payment companies instead. “TRAI officials have told Movida they will ask telcos to share USSD access and also specify the dates by when it would be given. As long as mobile payment firms meet certain conditions like authorization from a bank, there should be no problem. For instance, in case of Movida, it should be clearly spelt out that bank X can provide certain services to its customers through Movida,” said a person who is aware of the discussions. Though the number of mobile users in India is increasing rapidly, a greater percentage of them use only entry level basic handsets and not smartphones, due to which they get deprived of mobile banking facilities. According to an estimate, 75% of the users in India do NOT have smartphones. The decision to roll out such services will be another step towards customer convenience and could help improve bank penetration eventually. Movida’s entry may give USSD a much needed new push. Although NPCI already has the code and has expressed willingness to provide USSD based banking in Hindi and other regional languages, the fact that it works on a limited budget has so far been its biggest bane and held it back from launching a huge ad campaign and striking joint promotion deals with banks. With bigger budgets at their disposal and marketing experts to guide them, Visa and Movida are capable of making a huge difference. [Updated] Xiaomi Brings Redmi Note @ Rs. 8999, 4G Variant @ Rs. 9999!